I went in this cafe on a Saturday evening in April and took pictures but didn’t stay because it was noisy and crowded then. But when I went back on this rainy Saturday afternoon, the atmosphere was completely different. 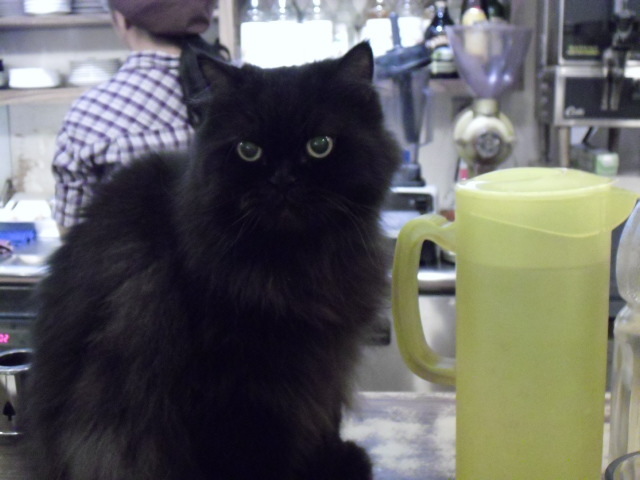 It wasn’t crowded, there was soft background music, and the staff were friendly and efficient. The cats were also very friendly. 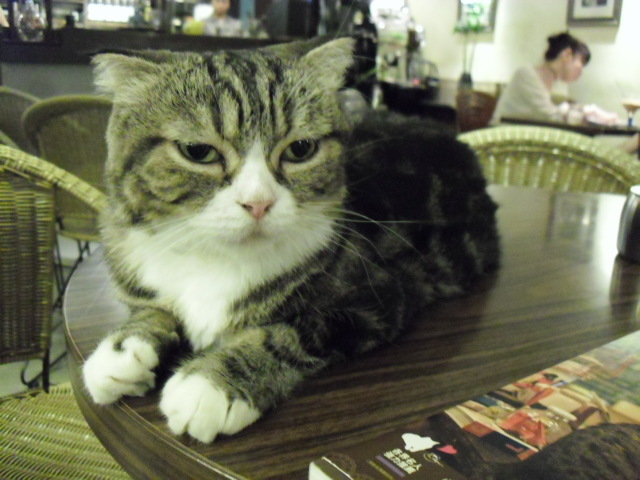 I was lucky to sit at a table with a cat on it. 我第一次去這間, 我進去拍一些照, 但是沒有留下來因為禮拜六晚上人太多. 這一次是禮拜六下午, 下雨的天, 我覺得環境很不一樣. 沒有很多人, 有好聽的音樂, 服務很好. 貓都很漂亮很可愛, 很喜歡被摸. 我很開心一隻坐在我桌子上. 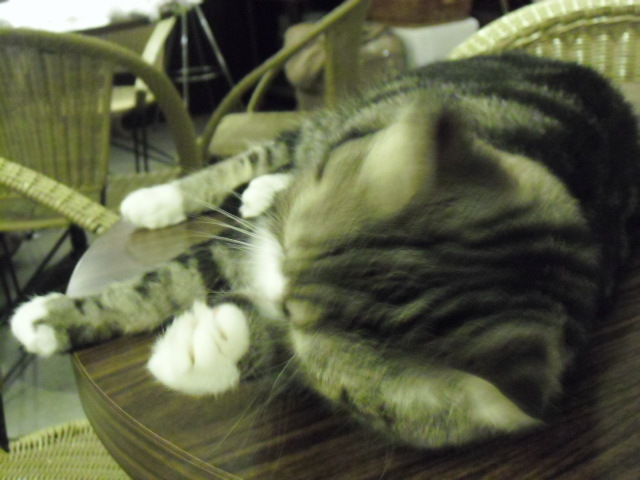 She stayed on the table the whole time I was there. 我在的時候, 牠也一直在. 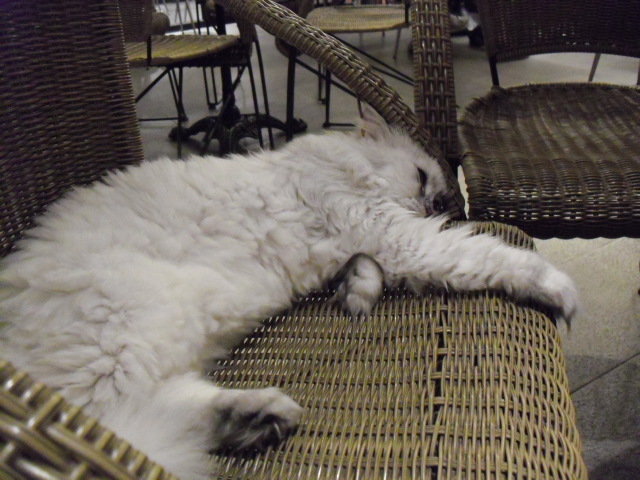 This beautiful, fluffy cat slept on a chair at a nearby table, and everyone who walked in stopped by to pet him. 每個人看到這隻很漂亮的貓都去摸牠. I think it was crowded when I went there before because it was around dinner time, and they do offer a full dinner menu. The cheapest menu item is an espresso for NT$90. 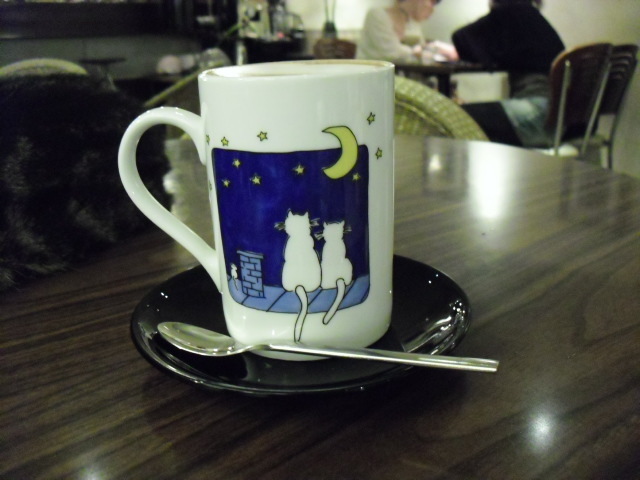 I had a cafe mocha with banana flavoring for NT$120. 我想晚餐的時候人會比較多因為菜單有很多儀式餐. 最低消費是黑咖啡 (NT$90). 我喝香蕉摩卡(NT$120).